You’re right, everyone’s schedules are busy. Precisely the reason successful families set the family business retreat as a recurring event, such as the third weekend in June every year so everyone can get it on their calendar. In terms of making the time, we constantly remind families that you can either pay now or pay later. In other words, take some time now to build relationships and framework for how to be involved in the family business or pay later in terms of fractured relationships Kama tension, and people wanting to be involved in the family business without proper training or expectations. 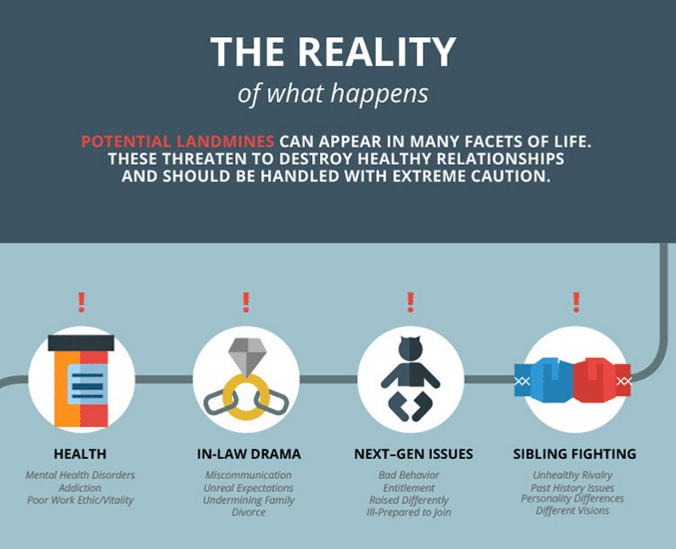 If you really want to see what can happen check out our Family Business Landmine Detection Kit. 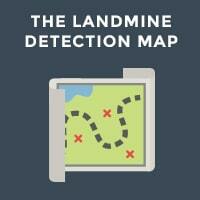 Click here for the Landmine Detection Kit. Having a family retreat is an important process for teaching the family how to work together and create a common vision for the family business. The amount of content isn’t the most important part. The most important part is to get people in the habit of coming together to learn how to communicate and listen to each other. Some of the best family business retreats actually have a fair amount of open space in the agenda for recreation and casual conversation that can really build and strengthen relationships that later will be invaluable to have when conflict arises. Of course not everyone will want to attend. The family leaders need to stand tall and encourage everyone to be involved in the process knowing the bigger picture agenda, which is to help bring a team together and stretch people out of their comfort zone. Where would my two 20-year-olds be if I simply allowed them to not do certain things because they didn’t want to? Typically, we see reluctance in the first year or two of the family retreat, but over time people begin to appreciate the value of the meeting and learn how to participate and get the most out of the process. They may not all get along. A certain amount of tension and conflict is normal and inherent in every family. The whole idea of the retreat is to begin to learn how to communicate better and get along in a safe practice setting like the retreat, so that when the heat is on in the business setting people are more comfortable dealing with their differences and their communication styles. The goal is not for everyone to get along. The goal is to learn how to effectively discuss the different views of the world and collectively solve problems. The best business teams know how to have constructive debates, yet find common ground and make sound decisions. A well-run retreat will bring up some areas of conflict. Successful families realize it’s better to surface those disagreements and find ways to resolve them rather than simply allow them to simmer underground. The family retreat process is a recurring event so your escape hatch or fall back is to put some of the difficult topics in the parking lot and seek advice between now and the next retreat as to the best ways to deal with those issues. 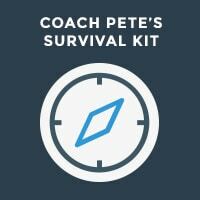 My experience has been that most of the difficult issues get resolved easier than most families anticipate. You will be surprised how creative and reasonable people can be if you create the right setting for learning and exploration. Don’t fall into the trap of these common excuses. 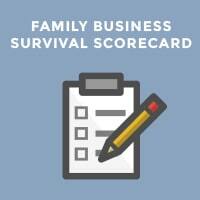 Your family will be well served to create an ongoing process to have open, honest dialogue about the family business. Real leaders understand there are obstacles and challenges, but lead their team by example by facing the challenges head-on.